Wesley Merritt (1834-1910), Major General, USA (NY/IL). Participated in the Battle of Gettysburg, Army of Potomac cavalry campaigns, Indian wars, and led the landing force at Manila in Spanish American War. 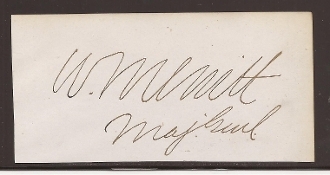 Clip autograph with rank as Major General.